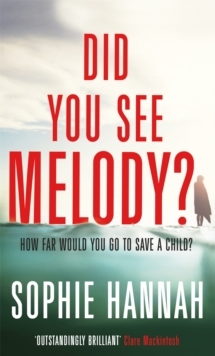 'Outstandingly brilliant' Clare MackintoshDid she really see Melody?The stunning new pageturner from the Queen of Psychological Suspense. Pushed to breaking point, Cara Burrows abandons her home and family and escapes to a five-star spa resort she can't afford. Late at night, exhausted and desperate, she lets herself into her hotel room and is shocked to find it already occupied - by a man and a teenage girl. A simple mistake on the part of the hotel receptionist - but Cara's fear intensifies when she works out that the girl she saw alive and well in the hotel room is someone she can't possibly have seen: the most famous murder victim in the country, Melody Chapa, whose parents are serving life sentences for her murder. Cara doesn't know what to trust: everything she's read and heard about the case, or the evidence of her own eyes. Did she really see Melody? And is she prepared to ask herself that question and answer it honestly if it means risking her own life? ******What people are saying about DID YOU SEE MELODY? 'I was hooked!...there was a cracking ending!' GoodReads reviewer'Really good reading that moved at a fast pace and kept me engaged throughout.